The Sony A7 series of full frame mirrorless cameras has the reputation of being the go-to body of the pros. What do you match with the best? Only quality glass will do. Luckily, the array of selections is about as limitless as you can get in the mirrorless world. What are the best lenses for a generation Sony A7 body? In this article, we’re going to talk about the native (Sony) lenses available. On top of this impressive list, you’ll learn about other brands you can adapt and expect reliable performance from. Let’s begin with the basics. 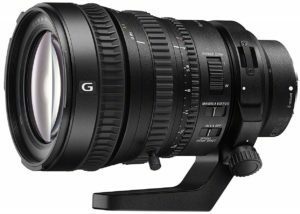 Your A7’s lens mount is a bayonet type from the Sony E system. 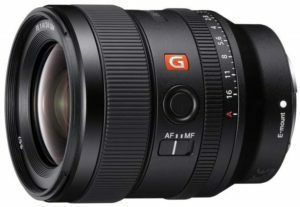 As of this writing, Sony offers over 80 native lenses in its E series, labeled as FE. That number is growing rapidly. Sony also sells an adapter that allows you to add their A series to your gear. Third party adapters broaden that further to the Canon EF series lenses. That’s another 300 possibilities in your bag. Third party lenses are also listed as working on the E mount. However, you’ll need to pay attention to how well they integrate with the camera’s autofocusing system. With so many possibilities, how do you choose? It depends on how and what you like to shoot. Next, we’ll answer some of the common questions we hear from folks shopping for lens to use on their Sony A7 series bodies. 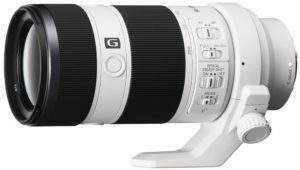 What is the benefit of prime over zoom lenses? Prime lenses have only one focal length. A 50mm (Nifty Fifty), for example, only shoots at a focal length of 50mm. Often, it also has only one aperture setting, such as f/1.8. That indicates the amount of light allowed to enter through the lens to hit the sensor. Professional photographers touted primes as the best. That is because of the tight settings and ability to control both depth of field and light. They would often also say the quality of the optics design, glass and manufacturing were superior. Primes could be thought of as solid single purpose performers. They are the absolute best for the kinds of shooting within their focal range. Zooms with their range of focal length and often, range of aperture values, have improved drastically in recent years. Today, they meet or surpass the standards of primes gone by. They also offer opportunities to fine tune your shooting, both in focal length and aperture value. That way, you can capture the best image possible before you ever hit post-production. Check a pro photog’s bag today. You’re bound to find a set of zooms across shooting ranges alongside their favorite primes. Which is more important, focal length or aperture? This discussion circles back to what and how you like to shoot. If you like to bring the distance up close (shallow depth of field) against a blurry background (bokeh), you might find both to be important. Depth of field is controlled by the focal length (longer is better). Bokeh relies on aperture value (higher means a smaller area of sharp focus). If you shoot primarily in situations where you can’t control light conditions, but you can get as close or as far as you like, aperture will be critical to capturing as much light or as little that you need for good image quality. If you like to shoot at a distance, like wildlife, or across a broad expanse, like landscapes, you’ll probably pay more attention to focal length. According to the pros, it’s harder to control your balance between light and depth of field when you shoot with an aperture range lens. A solid approach is to buy a lens to meet your focal length needs. Then decide if you also want an aperture range rather than a fixed value. While post-production adjustments can repair some lighting problems, it might not work for over exposed exterior shots or under exposed interiors, both conditions that tend to happen until you master aperture settings. Having a range of focal lengths handy when you can’t adjust your distance from your subject, on the other hand, will always be useful. Do I need to adjust for crop factor when I choose a lens? The short answer for the Sony A7 series is no. A7s are full frame sensor cameras, meaning the crop factor ratio is 1x. How your lens is labeled in focal range (#mm) is exactly how it shoots. Think of looking down a tube from the middle of a roll of paper towels. You can only see what it is in front of the fixed width of the end of that tube. A wide angle effect would be like making a megaphone shape from a sheet of paper and looking through it, where you see a broad expanse. These wide field of view lenses are great for shooting big expanses while still keeping your primary subject precise in the foreground. You can also exaggerate the size difference between objects in the background (appearing small) and your subject (large by comparison) by shooting with a wide angle. Wide angles are best used for landscape work, big frames of architecture, and interior where you cannot move further away from your subject. Focal lengths of 35mm or shorter are generally considered wide angle. Go below 24mm and you’re in the ultra-wide angle category. These lenses come in both prime and zoom with an array of aperture options. When is a telephoto lens best? Telephoto lenses bring something up close, like looking through binoculars. Because of their structure, they accomplish this visual magic in a much shorter tube than one would need without the telephoto optics. Teles come in both prime and zooms. This is a case were in many reviewers’ opinions, zoom is preferred for your shooting flexibility. These long focus lenses are best for photographing things at a distance while maintaining sharpness in the surroundings. Wildlife and sports are two such examples. Telephotos can also be used for portrait shots, such as weddings. That is, as long as you can move far enough away to focus on the whole face instead of just the nose. Short telephotos range from 85 to 135mm, and medium from 135 to 300mm. Higher focal ranges over 300mm are considered super teles. With each jump in focal range, there is a corresponding increase in weight. Therefore, there is the possibility of shaking, which is why many medium and super teles come with a tripod collar you would use to anchor your lens and camera combo. What are the benefits of focal ranges in the middle over the ultra ends? In the middle of the wide angles and the teles, you have normal or standard lenses. Functionally, these are anything in between 35 and 65mm, with the center being a Nifty Fifty, the 50mm. The range is a loose label, though, since some people call an 85mm a normal lens too. Recall that wide angles are made to see wider than their opening, and telephotos compress their length with the use of telephoto optics. The primary benefit of a normal lens is that it is unadjusted or unchanged by optical effects. A 50mm has a length that corresponds to 50mm in relation to the aperture (opening). Normal lenses are great general purpose lenses, and you can do just about anything with them, within reason (and skill level). That’s why the Nifty Fifty earns its reputation from the pros of being the best single prime lens to own. If you’re shooting family events, vacations, or streets around town, a normal focal range lens will get the job done without any thought on your part. Can I use extenders with Sony FE lenses? Lenses can be enhanced (focal range increased) by using extenders, which screw on to the lens at the body end and add optical distance to the focal range. They are not cheap, but they offer the opportunity to expand the range of all of your lenses with one purchase. 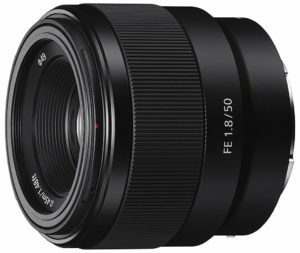 The most common that fit Sony’s FE lenses for the E mount line are 2.0x (increasing the effect to twice the focal range) and 1.4x (increasing by 140 percent). Sony makes a number of versions to achieve these magnification factors. Third-party extenders are also available, though there are some reports that the quality of their optics may match the quality of your lens. Are third party lenses second rate? For a long time, people held the general belief that third party glass (that’s a lens not made by a major camera brand and particularly not made by your body manufacturer) was inferior. Bodies made of plastic, lesser quality optics and mediocre manufacturing standards cost less for a reason, though those days of inferior are past us now. One issue that still arises from time to time is that third-party lenses might not work with your body’s autofocusing system. Your budget is important, and in some cases, you might buy a third party lens that is ‘good enough’ because that’s what you can afford. Our suggestion is that you buy a lens based on your shooting criteria, and then buy the best one you can afford. You can grow into a superior lens, but you’ll quickly outgrow one that’s subpar and doesn’t produce the images you want. A final note on Sony’s GM designation. It stands for ‘Grand Master’, which might sound a bit presumptuous. It references the professional level optics and manufacturing quality of these lenses, often with a price to match. Are all lenses equally good for shooting videos? Users who shoot a lot of video come down on two sides of a single issue, the autofocusing ability of the lens. Some believe that fast, accurate autofocusing is vital to quality videos, and others believe they’d rather have a manual focus setting to control the shots. Most prefer a lens in the wide angle range for their intimate studio type work, and a zoom in the normal range to move further away from the action. This being said, it depends on what you typically shoot video of. If it’s sports action on the field, you’ll want something that zooms in more, meaning a higher overall focal length. Other than the auto versus manual focusing debate, making your choice based on video alone is secondary to buying the best glass you can afford that fits your overall shooting subject goals. Do I need image stabilization in the lens? In 2015, Sony introduced the A7R II and the A7S II. With this second generation of A7’s (and all since), Sony includes a sophisticated image stabilization (IS) system in the mirrorless camera body. If you own a body made since then, you should have IS in the body and don’t necessarily also need it in the lens, though we’ve noted those with IS, so you have the choice, more important for longer focal lengths. If I can only buy one lens, which should it be? Don’t think of it as only one lens – think of it as your first. While some folks swear by the Nifty Fifty (50mm), limiting your first lens to a prime in the normal range means you miss out on the variety and versatility zooms at either end of the focal range can offer. For this reason, it’s a safer bet to buy a zoom in the normal range, covering wide to short tele and everything in between. Once you settle on what you like to shoot and how, you can expand your collection to add focal range (a wider wide angle or a longer telephoto) or zero in on the primes that will cover your most frequent styles. For this reason, we include lenses in different zoom ranges in our comparison, along with primes commonly used in each range category. Clearly, we could write an article comparing wide angle lenses only, or primes, or only Sony brand offerings. There’s a lot of ground to cover, so we’re focusing in based on the best for different shooting situations. Over time, you’ll want to accumulate a lens that covers each condition under which you regularly shoot. Here we note what shooting circumstances match the lens category. Note that while these are suggestions, you can shoot at the edges just as well as the middle. In this case, it all depends on how much you’d like to challenge your skill level and your comfort zone. We’ll tell you which focal range this lens falls in. It’s not a bad idea to have a zoom and a prime that cover each range as you add to your collection. When in doubt, get the zoom, because it offers you greater versatility. Lenses typically have the focal range in their name, but it never hurts to emphasize this. You may find older lenses, alternative major brands, or third-party options that come close in your own comparison. Overall size and weight for comparable lenses should be about equal. The smaller the f-stop number, the larger the opening through which light travels to the sensor. If you’re shooting in low light much of the time, you’ll want a small f-stop number because it offers the widest opening. Lenses operate outside their aperture number, though, with bigger known as ‘bright’, meaning able to handle more light. Some autofocusing (AF) systems work faster than others. Faster is better for action shooting or videos, but less vital for landscape and portrait work. We’ve noted the AF system, though it appears there are no bad choices in this list of lenses. Keeping in mind that camera body plus lens equals what you have to hold to shoot, sometimes the overall weight can become a burden. Without a tripod, your images can become blurry in shaking hands. The average A7 series body weighs roughly a pound and a half, so add this to the lens weight to calculate your total burden. Now, let’s take a look at what reviewers recommend most highly. Here are the best lenses for Sony A7 series mirrorless cameras. If low light situations where you can’t use a flash are your regular gigs, this bright wide angle zoom will meet your needs. It is considered a fast lens, meaning it also allows you to shoot action at fast shutter speeds because the aperture is wide enough to let in maximum light at any zoom setting. It is weather sealed, so you can take it outdoors without fear of damage in marginal conditions. The autofocus system is fast, making image capture much easier to achieve on the fly. It is also quiet, meaning you can shoot in those situations where you don’t want to draw attention to yourself, like a fashion or animal show or a photojournalistic setting. The high quality optics means your photos will be sharp and rich under a broad range of conditions. Zeiss makes Sony’s f/4 version of this lens, which had been a cornerstone of Sony’s offering until this lens came on the market. If you don’t need a lens that is as fast at the wide end, the less expensive f/4 might be an adequate choice for you. Users like the f/2.8 for its broader flexibility, which seals the purchase decision for many. Other things to consider here are the weight, which is again as much as the weight of your mirrorless camera body, and the lack of image stabilization. However, the direct drive autofocus motors work well for video. For still image resolution and speed in wide angle settings, this lens is unsurpassed. When your shooting distances need to vary from normal or standard range to distance, this zoom keeps you covered. Its image stabilization system gives it flexibility in slow shutter speed shooting settings, plus a tripod collar mount carries its weight for extreme tele situations. Weather sealing means it won’t need significant protection for the great outdoors, while the minimum focusing distance of three feet makes it good for interior work too. With its f/4 aperture, this is not considered a fast lens at the wide end, but it is suitable for tele. Keep in mind that this fixed aperture won’t allow in as much light, though for most interior and exterior work in its category, that should not be a problem. Its stepper motor AF is quiet and quick, great for inconspicuous photography. 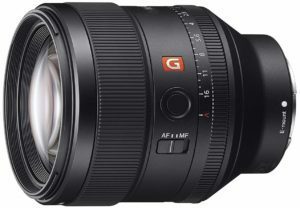 This lens is being touted as the replacement for the f/2.8 with the same focal range that is now primarily available as used equipment. It isn’t quite as fast as its predecessor, though its primary use appears to be more distance work than studio. Some reviewers consider it heavy in both weight and price tag, though it is consistent with others in its class. Users like this lens because it covers a lot of focal territory, making it a good choice for its versatility. It keeps the subject in sharp focus while creating nice blurring in the background, even in video mode. This lens may prove to be your favorite even when you own others covering some of the same focal length. If you’re shooting lots of wildlife or kids acting like wildlife, you’ll want this lens to capture sharp photos in good lighting with consistent quality image results. The tele end lets you fill the frame with small subjects and brings in the details, even at a significant distance. Image stabilization and tripod collar help you avoid blurring from shake and weather sealing invites outdoor use with ease. If you’re heading on safari or to the zoo, this lens will capture images that tell a creature’s story in intimate detail. The same applies for sports events, with gentle bokeh surrounding your subject. If the human or animal are on the move, you’ll be able to track their progress and click away while the accurate autofocusing system does the hard stuff. Since this lens has a variable aperture, you’ll need to become comfortable with the tradeoff in settings and effects between your focal length and the amount of light you require at that length (aperture setting). It is not particularly fast at either the wide or the tele end. If you’re shooting with manual focus, you’ll need to learn how to compensate for the changes in light exposure with the changes in zoom distance. As long as you have time to frame and set the shot in good light conditions, this won’t be an issue for you. 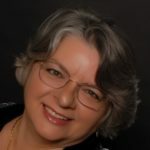 Reviewers comment that an advantage of these focal lengths is the ability to frame a shot to avoid cropping and the need for extreme post production corrections. Some vignetting and flaring have been reported, but once you understand its causes, you might be employing it for special effects to add more drama to your distance images. This lens was designed with videography in mind. From its broad focal range to its fast and bright capture at the tele end, it encourages you to try your hand at that action story or mini-documentary. It is weather-sealed, and coupled with the tripod collar and IS, you can stay outside as long as you like to get those perfect shots. Since it has a fixed aperture, you won’t need to worry about adjusting for the light since the AF system will take care of that for you. AF overall is fast, making it great for tracking your subjects as they move, or coming in close, less than a foot and a half. Users comment the zoom is smooth and speed is well controlled, meaning your videos will be clear and sharp across its distances. Reviewers do note that the AF system can lag behind in very fast zoom situations. 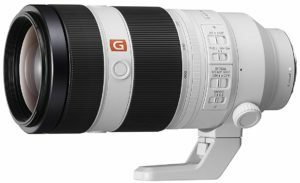 It is a heavy lens and a little larger than you’d expect, making it less travel friendly than others in the standard or normal range. The design of controls and ease of access to them on the barrel of the lens compensate for these two shortcomings. This is professional grade glass with a price to match those fine optics and manufacturing. It is interchangeable with both your A7 series camera and Sony video cameras as well, leading to more expandable uses if you carry both kinds of equipment. It offers a range of options, from sharp foreground and background to attractive bokeh, to give you versatile shooting choices in most common video ranges. If you only have room for one lens and you want a workhorse across focal ranges and variable apertures, this is the one to carry. From ultra-wide to medium tele, you have a range of shooting options at an affordable price. Even better, the lens offers a zoom factor of 10x, a rarity that encourages you to make this your go-to option. Users note image quality is terrific, with fine details appearing in shadows without creating noise or blurring. Bright color capture is also a big plus. They like its focus tracking and ease of use of its settings. This lens is not particularly fast at the wide end and is rated as slow at the tele extreme. While reviewers find this to be an unfortunate feature, the opportunity to carry one lens that meets more needs seems to make up for that. Others report the autofocus is not as fast as they expected, but they’ve adjusted their shooting style to accommodate that. You’ll want to educate yourself about how lighting and focusing play off each other as you move through the focal range. This lens may be heavier than you expect, but again, you’ll only have to carry one. If you have the option to select a first zoom lens with your initial A7 series kit, this presents you with opportunities to shoot under more types of conditions than any other. This prime lens borders on ultra-wide angle, with high quality optics and overall great construction to recommend it. It’s known for its premium image quality and beautiful bokeh, with a price tag to match all that amazingness. Fast autofocusing and light in weight, reviewers say this lens is worth the cost for those serious about wide angle work. This was the first time Sony used the DDSSM AF system in a wide angle prime lens. The linear type ultrasonic autofocusing system guarantees a fast process, quiet operation, and overall accuracy. Users note the performance and precision of this system maximizes the AF settings on the A7 series cameras when other lenses fall short in resolution, bokeh and vignetting. If the price point for this lens is out of your reach, Sigma makes a comparable option. It’s hard to beat Sony’s professional quality glass, though. The lack of unpleasant distortion alone is worth the admission tab. If you’re planning on shooting interiors a lot, such as real estate and architectural renderings, this wide angle will be an asset in your work. Similarly, it can provide interesting effects for portrait work, large groups, and events such as concerts or weddings in intimate settings. It sits at the sweet spot between ultra-wide and wide, and with that range capability, you can achieve fantastic images. Everyone should have a lens that can go from close ups to distance work while staying unobtrusive and fast, and this Nifty Fifty fits that description. The AF system is both fast and silent, making this a good choice for times when you want to avoid notice by your subjects. Think documentaries and weddings, and you have two primary reasons this lens should be a choice for your gear bag. Even the flaws of this lens can be used as positives, such as vignetting, which draws attention to the subject in sharp focus. This lens is fast, even under aperture adjustments. Its minimum focusing distance under a foot and a half means you can come in close in your framing. Some users comment that this lens needs a neutral density filter under bright sunlight conditions to avoid glaring and hallows. Others say the construction seems to be of a lower quality, less sturdy than other Sony brand lenses. However, it does what it should do, take good pictures without a lot of weight or cost. If you’re at the stage where you’re growing your skills at an exponential rate, this lens is a good place to begin. 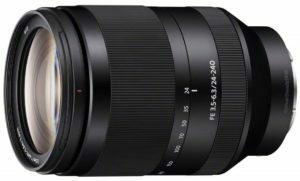 Sony makes a Zeiss lens at the 55mm focal length that can be your step up later on when you’ve developed your skills, but until then, this is an affordable and reasonable quality option. 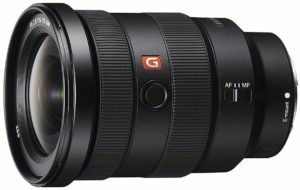 Photojournalists seem to agree, since many own this lens for their Sony A7 series mirrorless cameras and use it in the field on a regular basis. This lens excels in sharp, high resolution portraits where attractive, smooth bokeh transitions are expected. It also handles videos from head shots in close to groups at events, and everything in between. Since this range is usually the type of shots people like to buy, it pays for you to own a high quality lens that can meet and exceed their expectations. Full time manual focusing supplements the flexibility autofocusing supplies, which is most useful when you’re concentrating on the small details of facial expression or larger venue storytelling. This lens is very fast, which means you have more low light options than others might offer. It is also weather sealed, so working outdoors with a weather-sealed camera body will not be an issue. Reviewers find it difficult to say anything bad about this lens, other than the price. While the AF system is not Sony’s latest and greatest design, it has proven to be reliable. Minimum focusing distance of just over two feet means you can get up close and personal with your subject and keep the framing detailed and exacting. Buy this lens if you earn your keep shooting people in a variety of staged and dynamic settings. Don’t forget the pets and other creature shots you can get at this range too. This 85mm will prove to make your job easier and help you grab more exceptional shots to build your portfolio. Unlike some other third party lenses with adaptor mounts, the Zeiss Batis line is made specifically for Sony A7 series E mounts. Its manual focusing is deemed to be exceptionally responsive by reviewers. The light weight and minimal design with few features make it easy to use. 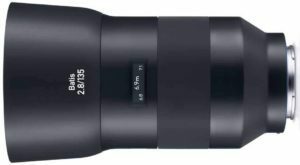 Zeiss carries on with its reputation of high quality optics and solid build with this and the other three primes it offers for E mounts. Images are sharp and clear with little effort on the photog’s part. The medium fixed f/2.8 gives you options in a variety of light settings without the cost or weight of a wider aperture. The fact that this lens has few features and adjustments is also something users might hate, though it’s hard to find a negative review. For example, it has image stabilization, but this cannot be turned off to avoid delays in focusing when panning. Some report changing the programmable settings in their Sony camera body to design their own standard shooting modes. While this isn’t the lens you’ll want for indoor portraits, it does a fine job isolating subjects’ expressions at a distance. Shooting action with crisp focus and pleasant bokeh makes this the glass you’ll reach for during those outdoors events. Work with it under manual focusing and you’ll be able to achieve a range of special effects without waiting for post-production adjustments. Macro lenses allow you to make small things appear larger than they would in real life at very close distances. Sigma adds its art quality glass, considered a premium level, to sweeten this deal. Images from this lens will stand out in crisp detailing and balanced lighting without making the photog break a sweat. Weather sealing makes this a good choice for outdoor uses. It’s bright in low light situations, while capturing your subject with just the right amount of background blurring. Vignetting stays to a minimum, offering pleasing effects you’ll enjoy keeping in your images. Reviewers universally love this light, compact lens. The only feature it lacks is IS, though because of its focal length and fixed aperture, you probably won’t need it. AF might not be as fast as some like and noisier than other systems, but for most of us, it’s enough to bring us the normal range image we want. Sigma’s reputation in developing a high quality third party brand has been well earned. This lens will be wonderful for food photos and for other close-ups where fine detailing is critical. Make sure you’re ordering the mount for your Sony, since Sigma ships the lens equipped with the appropriate adapter based on your order. 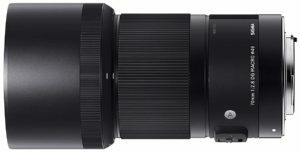 What about 24-105mm sony f4? It’s the best lens for Sony systems, and considering the price and range it’s even better than this wallet devouring lens.